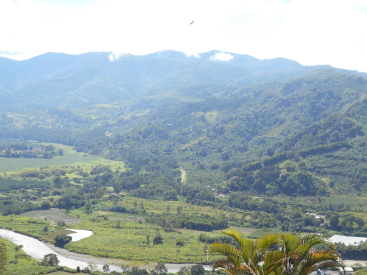 Almost 2 acre (8000m2) lot with the best view that we have seen of the Orosi Valley and surrounding mountains, Reventazon River, and Lake Cachi. One thing that makes this lot is amazing is the location. It is in a gated community with 24 hour security and at the end of a private drive with easy access on a nearly level road. Privacy is supreme! Enjoy the view and the pleasant year round comfortable temperatures of this paradise. The name of the town is Paraiso which means paradise. Electric, municipal water, phone, internet are all available. Looking for the perfect spot for your new home? Don't miss seeing this great building site. Or you can buy this and the house and cabin next door for $450,000.